Deluge seems like a VW Beetle from the inside, but once you open the hood… you could be looking at a Ferrari engine. 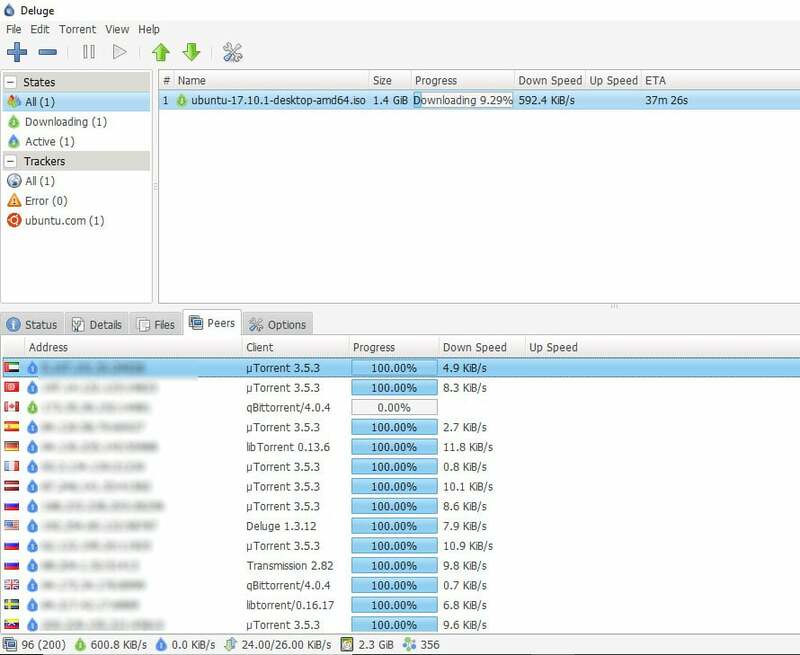 If you learn how to optimize Deluge like a pro, it could be easily turned from a simple and light BitTorrent client into the most powerful torrenting tool. Deluge, the king of customization, is an underappreciated client that is usually overlooked. Most users that try it, will never change it, and there are many reasons why. To keep it simple, Deluge is a fully-featured cross-platform BitTorrent client. It has been designed to run as both a normal standalone desktop application and as a client-server. 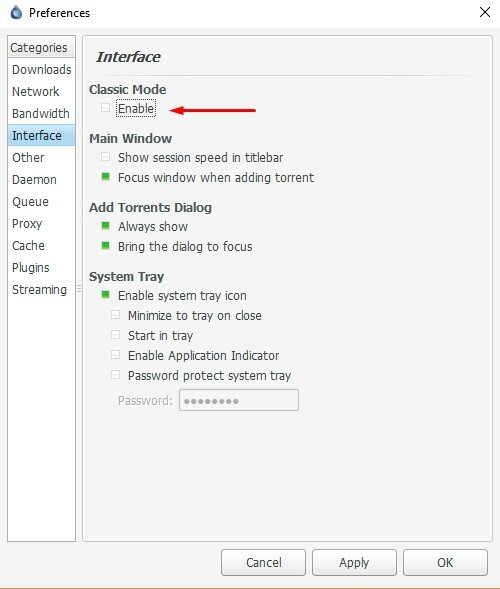 In Thin-client mode, a daemon handles all the BitTorrent activity and is able to run in the background on your machine while you connect to user interface (WEB-UI) remotely from any other platform. Many of our Seedbox clients choose Deluge as their favorite client since it’s reliable, convenient and very easy to use. The following ultimate guide to master Deluge will teach you how to optimize Deluge like a pro. With a few settings, you can turn your Deluge into the monster of torrents. How to install it on different platforms? Installing a Plugin in Deluge. Setting up Thin client for remote client management. Lower the chances of being blocked (or throttled) by your ISP. Allowing P2P users to make clean and fast connections through “Port Forwarding”. The “Test Active Port” fails. Stops downloading torrents and show an error message. Torrents not working with VPN. Deluge is a BitTorrent client that is supported by most Operating Systems, such as Linux, Windows, MacOS, and BSD Unix. The great thing about Deluge is that it is open source, free, and comes without annoying ads. If you can read the code, you will know right away that the code is secured, protects the privacy of its users and does not contain any malicious code. The open source code can be found here. Deluge is considered one of the top clients among serious torrent users because it is very light, simple and fast. But despite its simplicity, it can be highly customized to match even the most demanding users. Deluge is the king of customizable torrenting clients. Thanks to programmable modules (or plugins) you can implement different software complements and take its functionality to a whole new level. When compared with other clients, Deluge is very small in size and it does not come with unnecessary extensions and advertisements, and thus consumes very low resources on your computer. The client can be either run as a service in the background (for a remote system) or as a desktop application. Still trying to make up your mind? Most of the basic characteristics that define a real torrent client are not considered an advantage, but a necessity. Deluge is one of those real torrent clients with all basic features. It does not come with embedded advertisements. Its functionality can be improved with the help of plugins. Deluge is open source and free. It is super light (always under 15MB). It can encrypt BitTorrent traffic through the use of MSE/PE or Message Stream. Encryption/Protocol Encryption. It is highly portable. It can be installed on a USB and ran directly from it. Deluge comes with all the torrent basic features, such as DHT, PEX, prioritization, Magnet Links, etc. 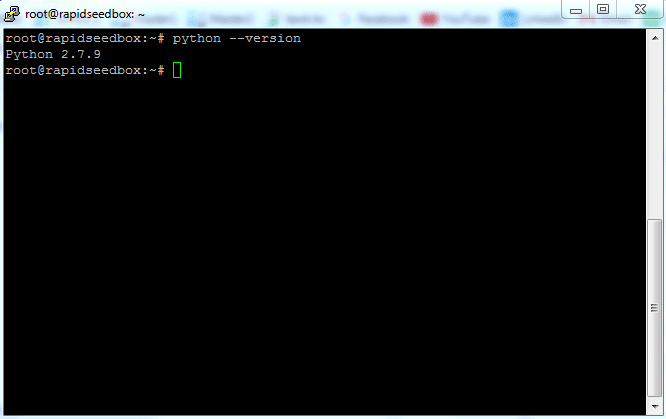 It has a graphical web and command line interface (with daemon). It allows automatic port mapping with UPnP, NAT-PMP, NAT for automatic router configuration. Not able to override queuing settings or “Force start” downloads. There is no built-in search engine. It is unable, by default, to stream media files while a download is in progress. But there is a workaround that will enable you to stream videos, the plugin is called Deluge Streaming. Limited magnet URI functionality. There is no way to get information about torrent content in a magnet link until the download has started. No super-seeding setting enabled by default. But you can apply this plug-in to get around this issue. It does not allow tracker exchange functionality. Not able to share files with an embedded tracker. The demon consumes large CPU resources as compared with other clients. When downloading your Deluge client, you will find a wide availability of different platforms to choose from. Download the correct version and follow the next instructions to install Deluge. How to install Deluge on Ubuntu? How to install Deluge on Debian 8.3? 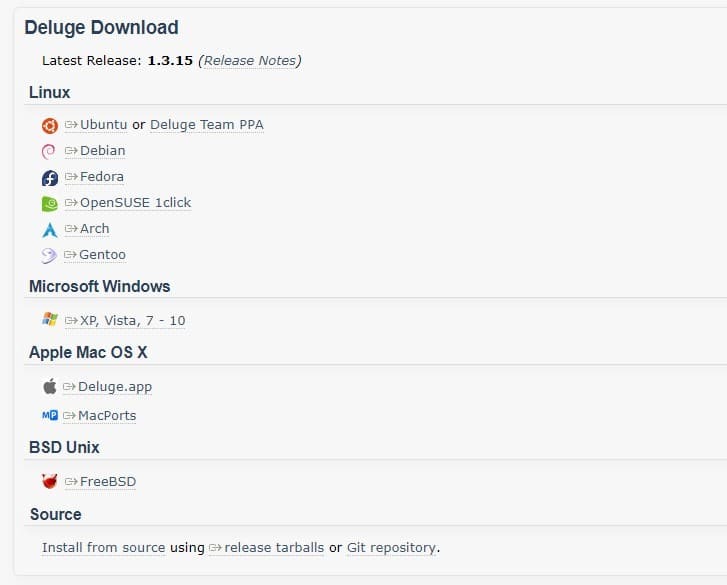 To install Deluge on Debian, you first need to add the repositories to the sources.list with an editor like “nano”. Then copy/paste the following lines at the end of the file. Save your changes, then update and install. 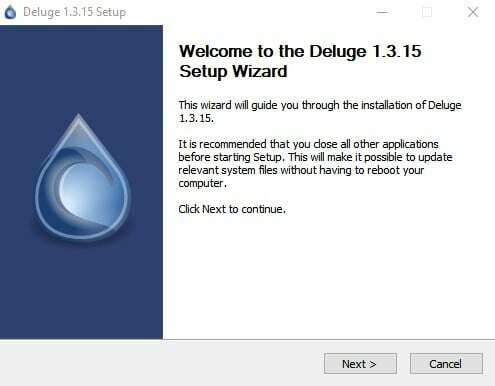 How to install Deluge on Windows? To install Deluge on Windows platforms is really straightforward. Once downloaded, run the executable file (.exe). If it was downloaded from a source other than deluge-torrent.org, you might want to scan it against Malware. 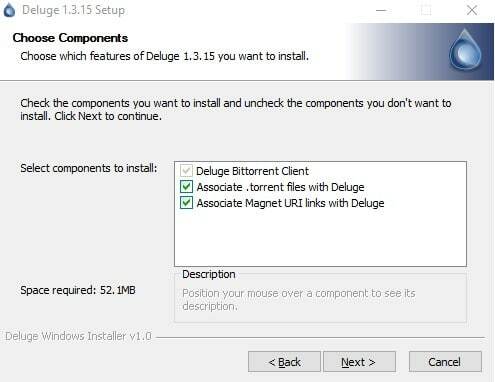 In the next step, you will need to select the components to install with Deluge. The client is grayed out because you are installing the client itself, but if you have another torrent client, such as uTorrent and want to leave that client to handle all .torrent files, and let Deluge handle all magnet links, this is your chance to customize which components to manage with Deluge. In the next steps, choose your install location and click Install. That’s it… Deluge is installed on your device. – Browse to your Credentials page (in the client area). Note: Deluge Web-UI(remote access) and Deluge (GTK desktop application) design are slightly different. For purposes of this article, we will use screenshots of the Deluge Web-UI. 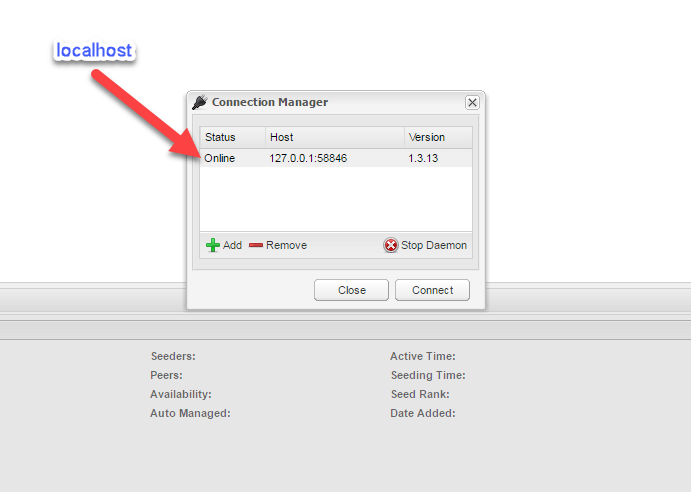 In next step, Connection Manager will open, select your localhost and click on button Connect like in the picture below. When you finish logging in you will see your dashboard. One of the first things to notice is a menu bar. We will explain step by step what is the purpose of every button. So let’s start explaining what every button do! “Add” button is for adding torrents. “Remove” button. With this button, we can delete single or multiple torrents. “Pause” button we can use for pausing torrents. “Resume” button role is to resume downloading/uploading your torrent/torrents. “Up” Increase tracker order and priority of the tracker in use. “Down” Decrease tracker order and priority of the tracker in use. “Preferences” button where we can change all of the settings. 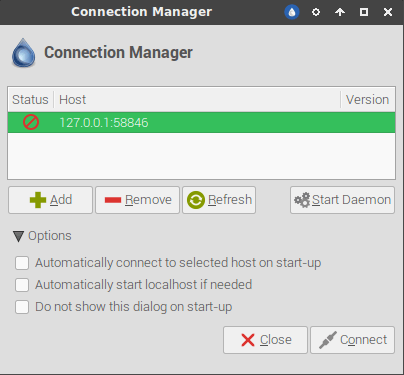 “Connection Manager” use this button to add new connections and start Deluge daemon. “Help” button. Click this button to access official Deluge support page. “Logout” use this button to log out of the current user session. How to load a torrent? “File” – Using this button you can browse for .torrent files that you have in your directory and add them into Deluge. “URL” – Using this button you can add URL of the torrent you wish to download and add it to Deluge. “Files” tab – Will show all the files that torrent file contains. “Options” tab – In this tab, you can set up your download destination folder and “max Download” and “max Upload” speed. “Remove” button – Remove added torrents from add window. How to create a new torrent? 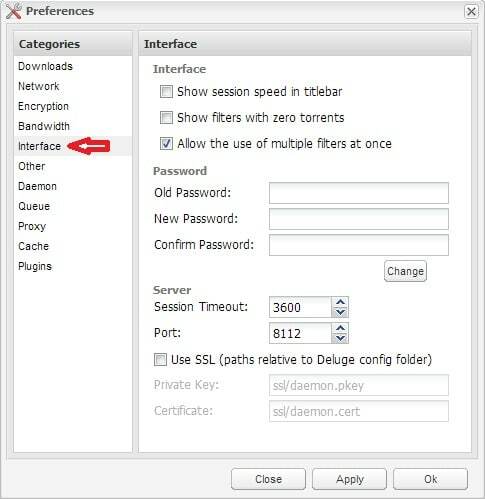 When using Deluge torrent client you can’t create torrent files using WEB-UI, you must use Deluge thin client or better known as Deluge GTK. 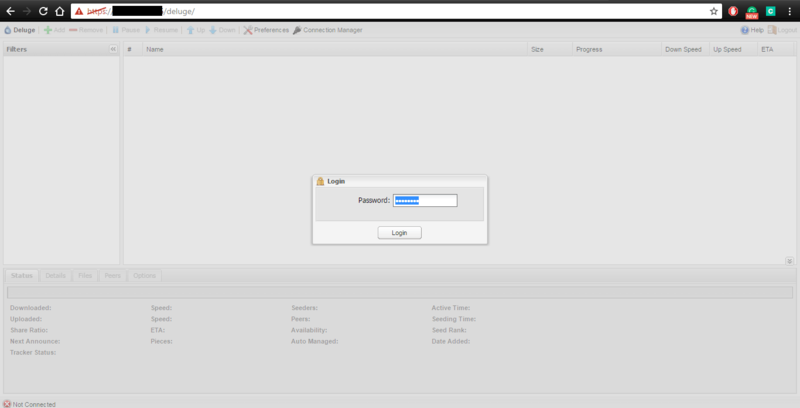 In order to do that, you have to connect to your Remote Desktop via X2Go and open Deluge GTK as on picture below. When Deluge GTK opens go to “File” tab in the top left corner and select “Create Torrent”. “File” – Using this button you can browse for files that you have in your directory and want to create a torrent of. “Folder” – Using this button you can browse for folders that you have in your directory and want to create a torrent of. 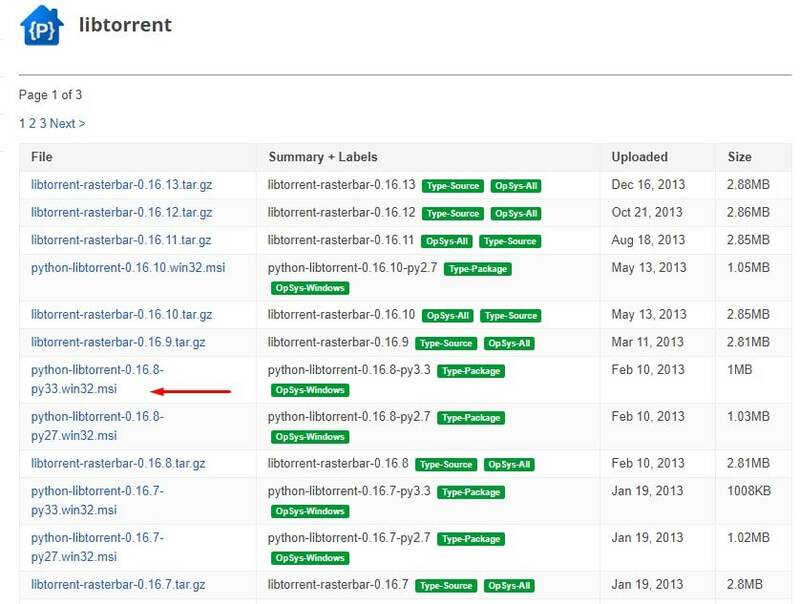 “Info” – Using this tab you can add information to your torrent file like “Author” and “Comments”. “Trackers” – This tab is used for adding trackers to torrent file you are creating. “Web seeds” – This feature is used so you can paste in the location of the web address to the hosted file when creating the torrent. “Options” – In this tab, you can set “Private Flag” for your torrent file, and set “Piece Size” that you wish your torrent to have. “Save” – Save your torrent when you create it. 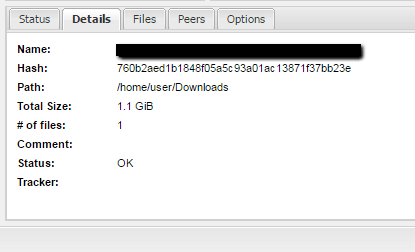 When you select a particular torrent (like on the picture), you can notice down below all info related to that torrent. You can see these tabs monitored in the real-time: Status, Details, Files, Peers, and Options. All of that info is very useful to find additional information regarding loaded torrent. “Downloaded” – Showing how much data is currently being downloaded. “Speed (Download)” – Showing how much data is currently being downloaded. “Uploaded” – Show how much data is uploaded. “Speed (Upload)” – Showing how much data is currently being uploaded. “Seeders” – Showing how much seeders are connected currently. “Peers” – Showing how much peers are connected. “Active Time” – Showing for how much time a particular torrent file is active. 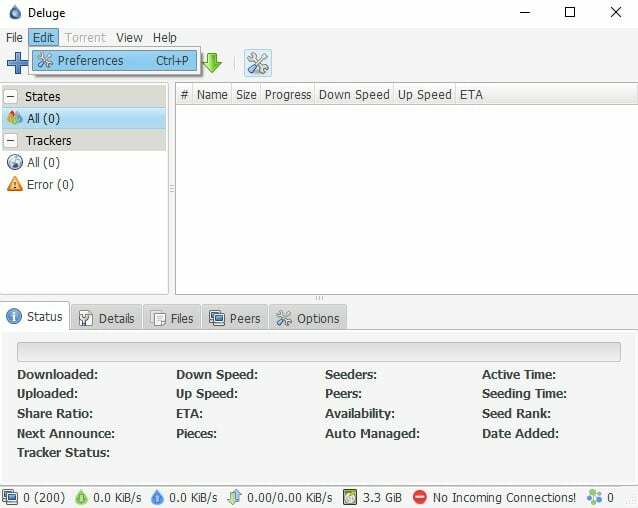 “Seeding Time” – Showing for how much time a particular torrent file is seeding. “Share Ratio” – The ratio that is calculated by dividing the amount of uploaded data by the amount of downloaded data. “ETA”- Estimated time that your torrent need to download the file. “Tracker Status” – Is showing info regarding trackers URL and its Status. “Pieces” – Is showing in how much pieces is your torrent file divided and how big they are. “Name” – Name of the torrent file. “Hash” – Hash representation of your torrent file. “Path” – Path to your data. “Total size” – Total size of your torrent file when it is finished downloading. “# of files” – Number of files contained in the torrent file. “Comment” – Comment that author of the torrent file created. “Status” – Status of your torrent file. “Tracker” – Tracker from where you are downloading your torrent file. In “Files” tab we can find info about particular files that are included in torrent data. You can find a name of the file, the size of that particular file, it’s progress and priority of it. The “Peers” tab is showing a real-time info about connected peers, their country, speed and much more. As the name says in options tab we can change options of our torrent files. We have three groups of options that we can change “Bandwidth“, “Queue” and “General“. “Max Download Speed” – Here you can set max download speed of your torrent. 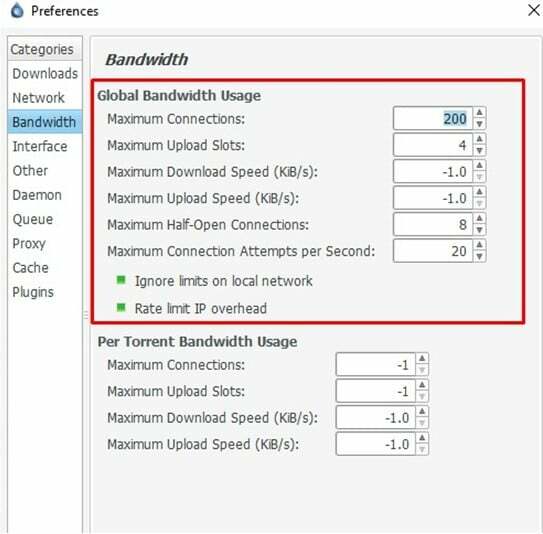 “Maximal Upload Speed” – Here you can set max upload speed of your torrent. “Max Connections” – Set max number of connections to your torrent file. “Max Upload Slots” – Set max number of upload slots for your torrent file. “Auto Managed” – Auto Manage your ratio and download location at torrent completion. “Stop seed at ratio” – Automatically stop seeding when you reach the certain ratio that you can manually set. “Remove at ratio” – Remove torrent file from the client when it reaches certain ratio that you can manually set. “Move Compleated” – When a data file is completely downloaded you can set directory that file will be transferred to. 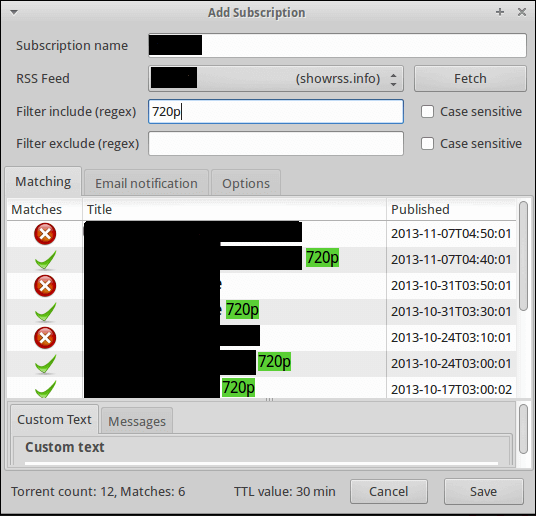 “Prioritize First/Last” – Set priority to your torrent files when they are downloading. “Edit Trackers” – Edit trackers from which you are downloading your data. The Bottom menu bar is very practical for getting quick information. It shows general “total” speed information and can be used to set the server Throttle level. Also, shows remaining free HDD space on your server. Hint: Our best practice is not to fill your HDD to a 100% in order to prevent your torrent client from freezing and crashing. The left side menu is designed to provide a quick info about loaded torrents. It provides the information about the current state of loaded torrents. “All” – Sum of total loaded torrents. “Downloading” – Sum of torrents that are currently downloading. “Seeding” – Sum of torrents that are finished downloading and are being seeded. “Paused” – All paused torrents. “Checking” – All torrents that are being checked by the torrent client. “Error” – All torrents that have some error active, that is preventing them from downloading/seeding. “Trackers” – Displays currently loaded, trackers. Your Downloads folder might be starting to get messy after many downloads. It is perhaps time to organize it and direct Deluge to keep it that way. Go to Edit > Preferences (or Ctrl+P). Change to an adequate and preferred location. By default, Deluge will save all your downloads to “Downloads” folder. You might want to change it to keep things organized. Go to Downloads > Folders, and choose the desired folder to download all content to. It could be media, stuff, movies folder or whatever. Plugins are probably what makes Deluge one of the most amazing torrent clients out there. To install a plugin, go into the official Deluge plugin website. You can browse through their immense library of, 3rd party, browsers, and application plugins. How can you actually use it? In this example, you will learn how to allow Streaming video and audio directly from Deluge client while downloading (something impossible with the original client) with the help of a 3rd party plugin. 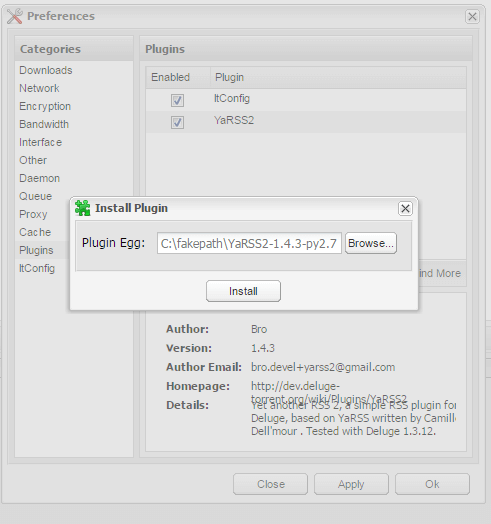 Find the “Streaming” plugin in the official Deluge library, and then download the “.egg file” inside the plugin site. Make sure you download the correct version for your Operative System. Once downloaded, go to your Deluge client, Preferences > Plugins > Install Plugin. Find the correct version, and click Open, if it doesn’t work, try with an older or newer version of the plugin. Finally, to enable the plugin just click the box next to “Streaming”. It will take a second, and then it will be shown in the left-hand side menu (as below). Setting up the Thin client for remote client management. To improve anonymity with Deluge, the torrents can be downloaded to a remote computer (server), not to your local computer or device. Deluge daemon “Deluged” can be installed on a central server, so that other computers can access and control it remotely through any Deluge UI, such as the desktop app or WebUI. To set up Deluge for remote accessibility, you’ll have to configure the remote server first. Once you install the Deluge daemon “deluged” into a Server, you can proceed to configure the local client. Restart your Deluge client. Once Deluge is back again, you will get the following message. Remote access is one of the greatest features of Deluge torrent client. It allows you to manage torrents remotely via a local client. You have to prepare your remote Deluge machine to accept remote connections, so please follow this tutorial carefully. To setup Deluge remote access, we need to configure our remote client first. Log in via SSH to your Seedbox. Issue this command to switch to the user account. The Reason for this is because Deluge is configured for the unprivileged account like users account. We need to find info about our Deluge. If you are using our default configuration, information’s like username, password, Seedbox IP you can find in our Welcome email, and default port is set to 58846. Now you need to do some little tweaks on your VPS/Seedbox. Login remotely via SSH. 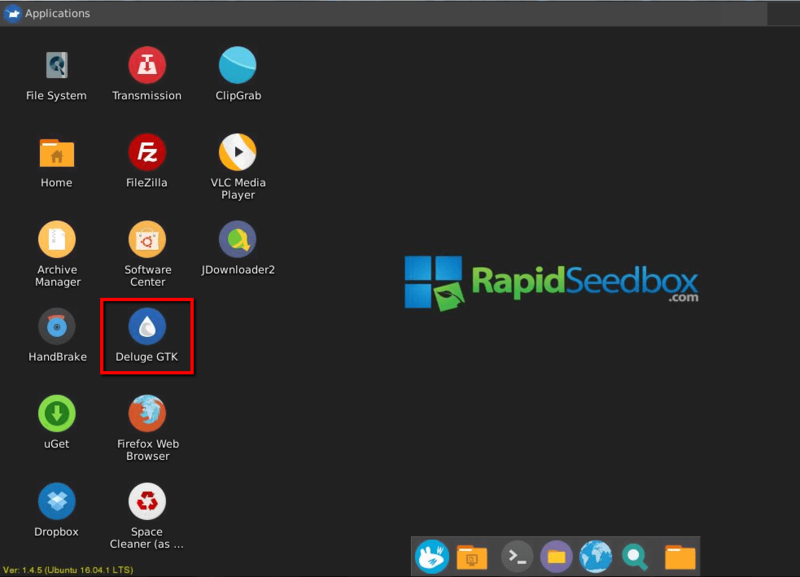 If you are not sure how, please follow this guide How to Connect to Your Seedbox using SSH. If you are logged via SSH as a root account, you need to switch to user account first, or to a user for which Deluge is configured. For everything to work properly, we need to allow remote connections. deluge-console "config -s allow_remote True" deluge-console "config allow_remote"
We need to disable Classic mode. Go to Edit/Preferences and navigate to Interface tab like on the picture. We need to add actual remote connection now. 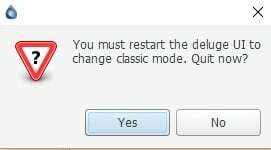 After you’ve disabled Classic mode, you need to restart your Deluge client. The window below should pop up when you launch it next time. If not, open a Deluge and navigate to Edit/Connection Manager or press Ctrl + M.
Click on Add button, and add parameters that you’ve obtained in previous steps. Press Add, then Connect. After this step, you should be able to initiate a remote connection with Deluge. Using your WebUI access URL – https://seedboxIP/deluge given in client area “My Services” page, paste into your browser and a login window will be displayed. Provide the default password and proceed by clicking Login. 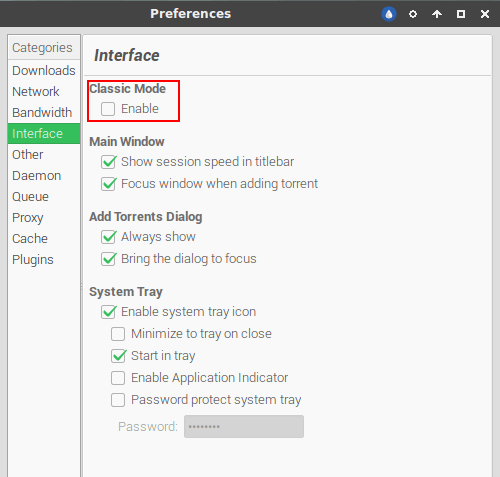 On the WebUI console, choose “Preferences”, then “Interface” on the next screen. One of the most useful built-in features of Deluge is its Scheduler plugin. A unique feature of this plugin is the ability to place limits on bandwidth usage throughout the day. Here’s a short walk-through on how to activate it on WebUI. Login to WebUI using the password given to you in the client area “My Services” page. Check or tick Scheduler and hit Apply then OK. Close this splash screen first and refresh the page. The next time you go to Preferences, Scheduler should be available at the bottom as a Category. 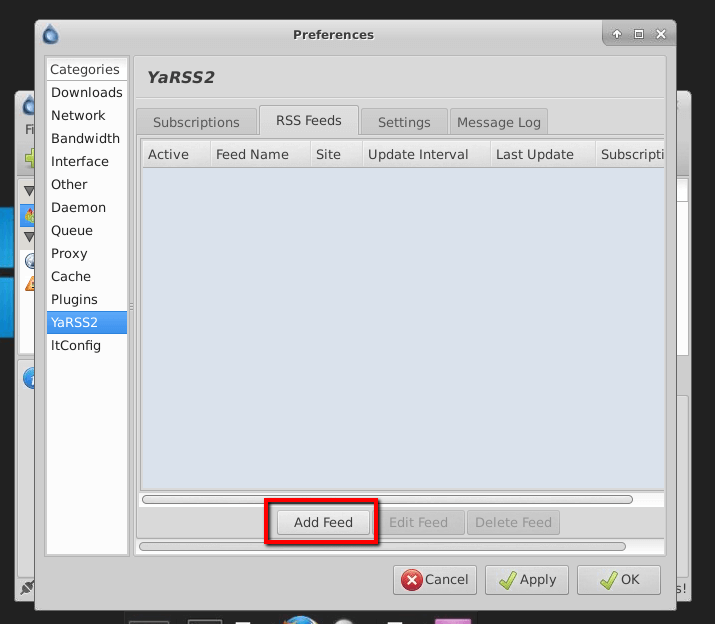 In this section, we will show you how to use RSS on Deluge in combination with YaRSS2 plugin. Frist thing you need to do is to connect to your Deluge WebUI. Then go to “Preferences” then “Plugins” tab. 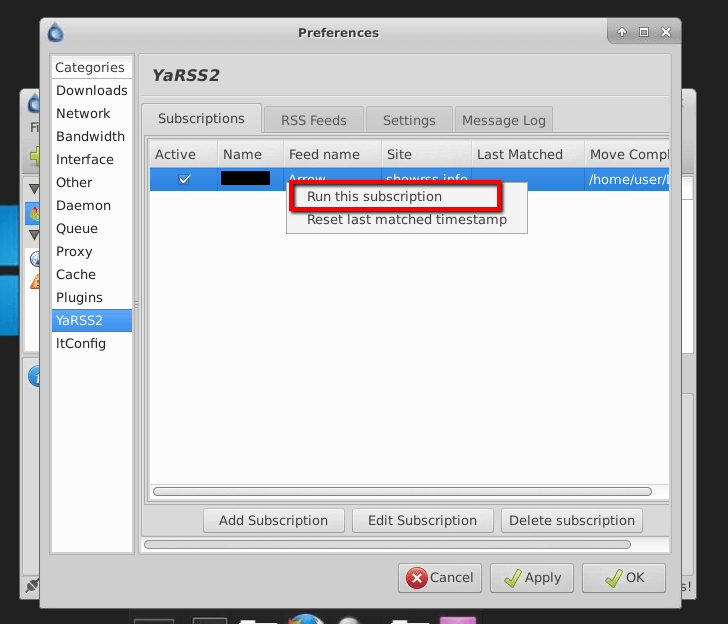 Select “YaRSS2” and click the install button. When you click “Install”, a new window will be opened and it will ask you to add “Plugin Egg”. “Plugin Egg” is version “YaRSS2” plugin based on “Python” version that you are using. So to find out your “Python” version you need to connect to your “ssh/root” and type in this command “python –version”. When you get your “Python” version then you need to go to this website: https://bitbucket.org/bendikro/deluge-yarss-plugin/downloads/ and download “Plugin Egg” for a version of “Python” that you have. After you download your “Plugin Egg” you need to go back to your WebUI and add it to install path. Enter an “RSS Feed name” and the “RSS Feed URL” for your feed then click Save button. Next, you need to click on the “Subscription Tab” then click “Add Subscription” New window will appear where you need to enter a name, select the feed you just added, and enter any filters you want. When you finish all that click Save button. Now under the “Subscriptions list”, right-click the subscription you just made and click “Run this subscription” and click OK. Allowing direct modification to libtorrent settings. To keep up with the latest torrent extensions, ltconfig is a plugin used in Deluge that allows direct modification to libtorrent settings. To know the correct file to download, find out about your Python version, by going to the command line in Windows “cmd” on and typing “Python — version”. 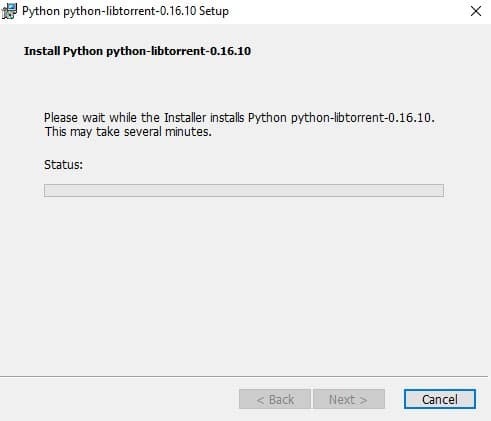 Execute the Windows installer (.msi) and then copy the “libtorrent.pyd” file from the install location to your Deluge folder. Go ahead and restart Deluge, you should now see the libtorrent version. The following settings are just suggestions. They work different on different scenarios and are not “fit-to-all” recommendations. You might have the fastest bandwidth and best computer, but your ISP might be doing a great job blocking torrent protocols. These recommendations should not be taken as the ultimate settings. But, most users that applied some of these settings are satisfied with them, so you will probably be as well. To allow torrent inbound and outbound communication flow freely, you might have to adjust your port default settings. The reason is that lower ports tend to be blocked by ISPs and they also tend to conflict with other application ports. Go to Network label and uncheck “Use Random Ports” for incoming and outcoming ports. 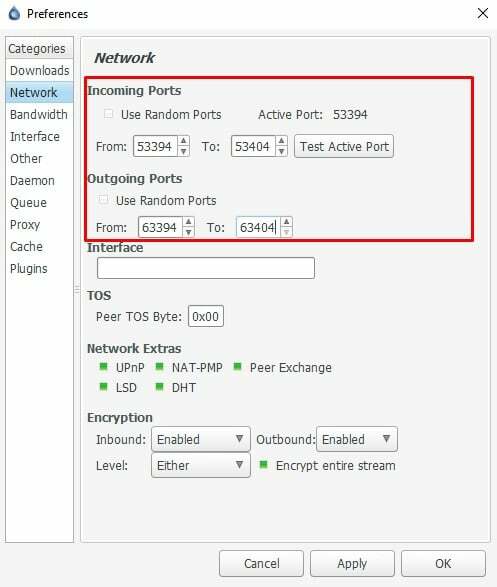 Change to the port number to any number between 50,000 and 65,000, especially avoid ports within 6881-6999 range, as they tend to be blocked by ISPs. 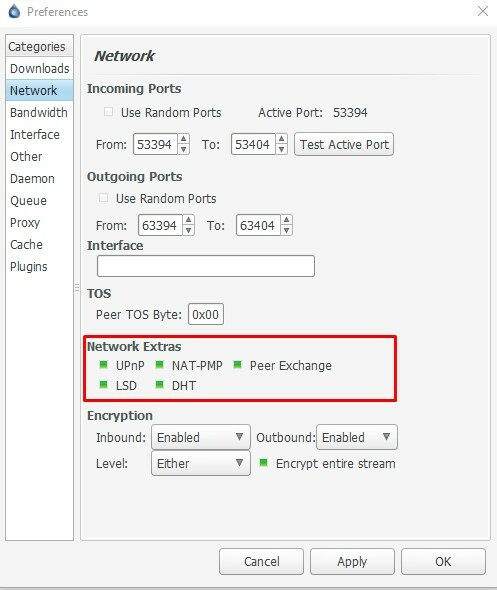 Some private trackers might require you to disable P2P technologies such as DHT or Peer Exchange, (under Network Extras). If you are using public trackers with your client, it is recommended to leave the Network Extras default settings (all on). DHT and Peer Exchange will help you find more peers and seeds to download your torrent faster. To allow maximum connectivity, you may want to make sure that your client is able to connect to other peers that have protocol encryption enabled. 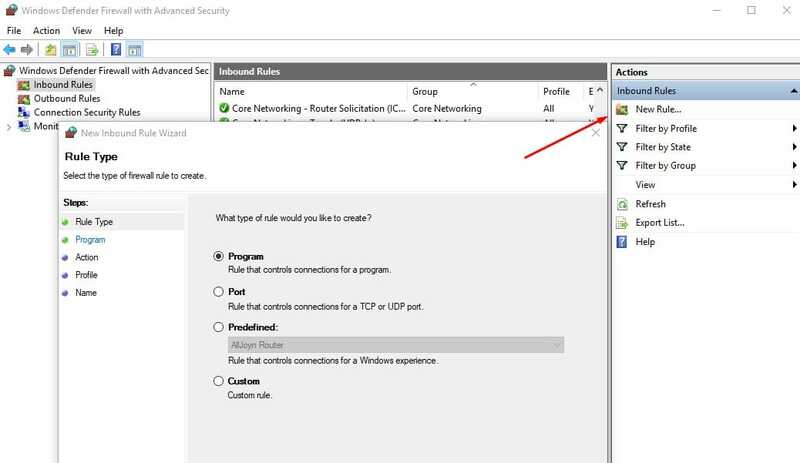 Make sure that the Inbound/Outbound Encryption at the end of the Network tab is set to Enabled. If you opt for maximum security, you can Force encryption. 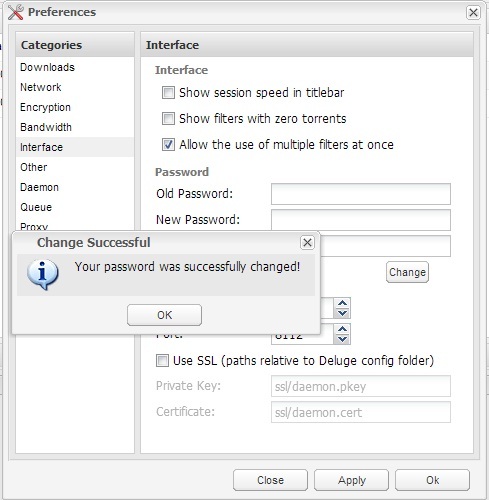 This option will refuse to connect to other peers that do not have encryption enabled on their end. If your Deluge ports are being blocked by either a firewall or router, your communication with other peers will be limited or will not even be possible. You will have to create exceptions and allow the port to be forwarded by your router/firewall. First, check your software antivirus and firewall and make sure that an exception is made to allow Deluge connectivity. For example, in Windows, go to the Windows Firewall, then Inbound and Outbound rules, and make sure that Deluge is set to “Allowed”, if not create a new rule. 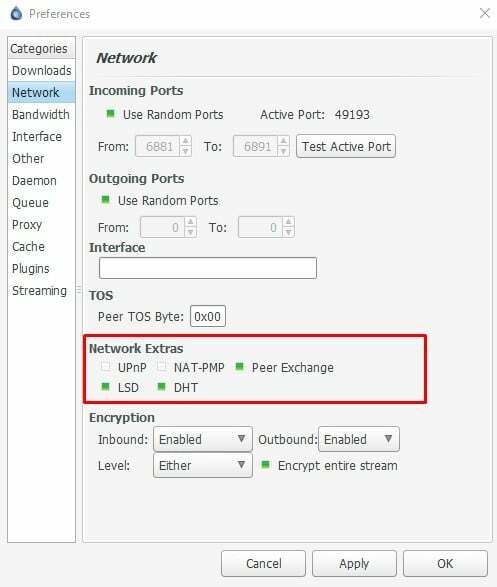 An easy way to enable port forwarding in Deluge is making sure that UPnP is enabled under “Network extras”. Of course, to make this work, the router will also need to be UPnP enabled. Most new routers have UPnP enabled by default. If yours is not, find your router’s manual and follow the instructions on how to enable it. It might sound smart to limit “Upload speed” and set your “Download speed” to unlimited. But BitTorrent protocol does not work like that, in fact, it was created with the “sharing” idea in mind. Actually, the speeds of your “Uploads” affect the speeds of your “Downloads”. In other words… if you don’t share, you’ll be penalized. BitTorrent uses a concept called “choke”, where the more you limit upload, the more your will limit download speeds. So how can you maximize Deluge download speed? 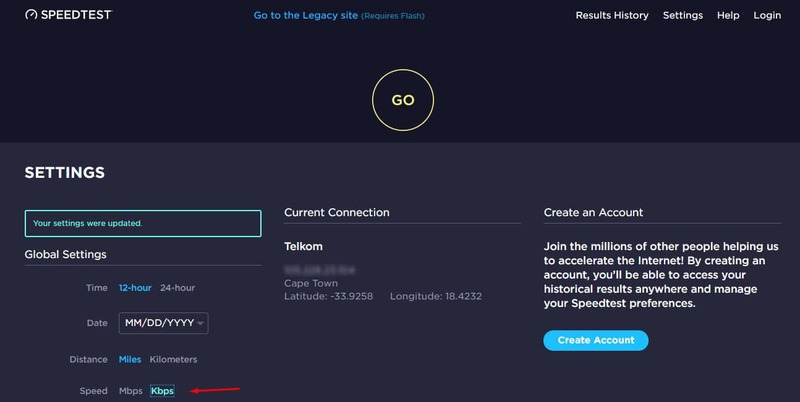 To test your Internet connection, go to Speed Test. In the Speed Test website, change the speed rate measurement from Mbps to Kbps (Deluge speed rate preference). To do this, go to Settings > Speed Measurement > Select “kilobytes” and click “save”. Test your speed and record your download and upload speed. To get a more accurate speed, you might have to test at different times and with different devices. Leave “Maximum Connections” and “Upload Slots” with its default values. Maximum Download Speed: The default settings (-1.0) mean unlimited. From the speed obtained in the test above, set this parameter between 80% to 90%. Maximum Upload Speed: Same as above, the default settings are set for unlimited. Reduce this value between a range of 80% to 90%. Do not go below, as it will also affect your download speed. Leave the rest of the parameters with its default values. Step 3: Maximizing your queue setting. Too much download/upload activity may result in overall slow speeds. But too little can also waste precious bandwidth resources. So how can you find the right queuing settings? It all depends on the measured bandwidth values found before. 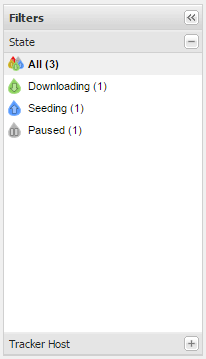 All active downloading torrents are also seeding at the same time. Deluge recommends setting your “Total active seeding” the same as “Total active” and the “Total active downloading” always proportionally lower. For example, if your upload speed is between 150 to 250 kbps, set “Total active” to 10, downloading to 8 and seeding to 10. If your upload speed is more than 250 Kbps set your values to 15, 10, and 15 (and so on…). To maximize your speed, even more, the option “Do not count slow torrents”, will not count slow torrents towards your total active torrents. Deluge is great out-of-the-box, but unfortunately, it has the same vulnerabilities as any other torrenting client. When you download or upload a torrent, you are exposed to the world. Your entire information such as public IP, country and even version of Deluge (thus OS) can be easily seen by other peers in the same swarm. On top of that, even though you might be downloading legal Ubuntu files, your ISP can monitor torrent activity, and block your connection. A Proxy: Not encrypted, just password-protected. A VPN: A much stronger encryption. A VPN is the best way to completely change your torrent IP address and encrypt all your traffic. OpenVPN is a great tool, to begin with, you can create client/server environment or just use any of their servers worldwide. A Seedbox: A high-speed performance Virtual Private Server “VPS” in the cloud dedicated to seed torrents. You are virtually using another computer in the cloud for all torrent activity. This is the best way to protect your identity online and stay secured. Seedbox by Rapid Seedboxes are the best and easiest VPS to begin with. Need more information on how to stay anonymous? The Ultimate Crib Sheet for Staying Anonymous Online might have the answers that you are looking for. You might be faced with some problems while you optimize Deluge… even the best torrent clients are not perfect out of the box. Just like any other application, Deluge might give you some headaches down the road. Fortunately, the Deluge community is pretty helpful, so you’ll probably find some help to solve the issue. The following are three of the most common problems found to be affecting the highest number of users. Check if you have the same symptoms and try following any of the solutions. If you are seeing the “No incoming connections!” at the bottom of the Deluge client, you might be having a port mapping issue. You might still be able to download but probably are not able to seed. The “no incoming connections” is probably a symptom of a closed port (at least Deluge sees it that way). First, try restarting any firewall or router that might be blocking the connection. If that didn’t work, by all means, make sure that your firewall has the Deluge exception (deluge.exe, deluge-console.exe, deluged.exe, deluge-gtk.exe, and deluged-web.exe), and that the firewall/router is accepting all incoming connections from the Internet to the program. If you defined ports between 50,000 and 65,000, you are on the right track. 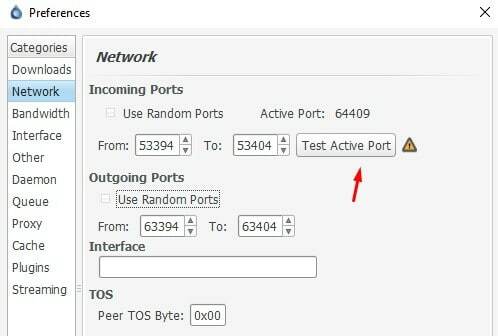 To pass the “Test Active Port” you need to first make sure your port forwarding is working. You can use an open port check tool like CanYouSeeMe and test whether the tool can see your Deluge through that port. If that fails, then it means your ports are not forwarding. Enable UPnP in Deluge and on the router. Make sure that your antivirus / antimalware is not blocking your connection. If UPnP is not an option on your router/ firewall, you will have to do manual port forwarding. Look into your device’s instructions manual and follow the steps to forward a port manually. Downloads randomly stop and display an error message in the download bar. Check whether the status of the torrent is Ok. Some file scanning applications like Antivirus might stop your download. Upgrade or Downgrade your program. Your Deluge client is not able to find peers for your torrents or at the best case, it downloads very slowly. Usually, VPNs will not discriminate different types of traffic to maintain security and privacy of users. The job of the VPN is just to forward traffic from your local computer through a tunnel into the destination on the Internet. Problems with torrents and VPN are usually related to the configuration on the local machine or the VPN server, not related to ISPs. 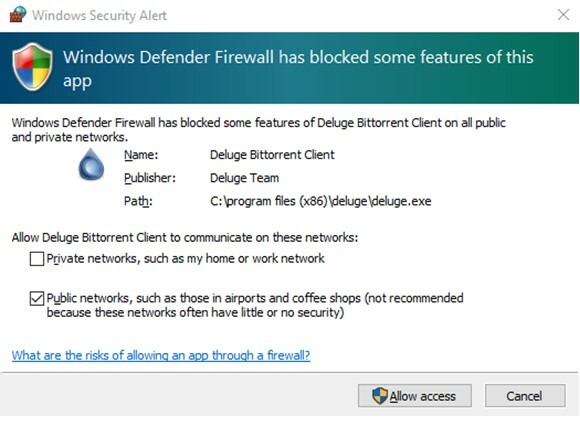 Check your internal software firewall / anti-malware and make sure it is not blocking the connection of the program. If they are, make an exception. Try disabling UPnP and NAT-PMP, as they will automatically assign ports that might not be specified on the firewall of the VPN. To disable these parameters, go to Edit > Preferences > Network > Network Extras. Use the open port check tool CanYouSeeMe to make sure that your ports are open. If the tools fail to open communication with the Deluge ports, it means that your ports are being blocked. To solve this, you will have to manually forward your ports.